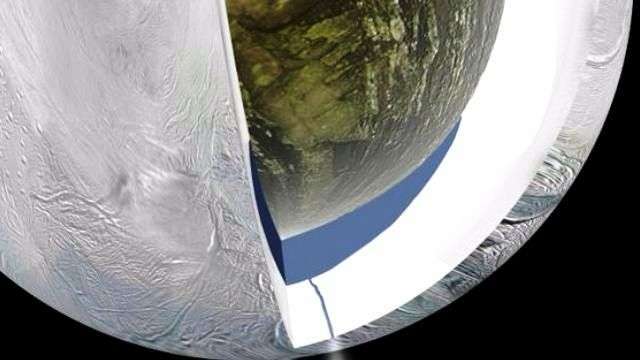 "We've been following a trail of clues on Enceladus for 10 years now," said Bonnie Buratti, a Cassini science team member and icy moons expert at NASA's Jet Propulsion Laboratory (JPL) in Pasadena, California. "The amount of activity on and beneath this moon's surface has been a huge surprise to us. We're still trying to figure out what its history has been, and how it came to be this way." NASA's Cassini spacecraft will wrap up its time in the region of Saturn's large, icy moons with a series of three close encounters with Enceladus starting Wednesday, Oct. 14. Images are expected to begin arriving one to two days after the flyby, which will provide the first opportunity for a close-up look at the north polar region of Enceladus. Wednesday’s flyby is considered a moderately close approach for Cassini, which will pass at an altitude of 1,142 miles (1,839 kilometers) above the moon's surface. Closest approach to Enceladus will occur at 6:41 a.m. EDT (3:41 a.m. PDT). The spacecraft’s final two approaches will take place in late October and mid-December. During Cassini’s early-mission encounters with the moon, the northern terrain of Enceladus was masked by wintry darkness. Now that the summer sun is shining on the high northern latitudes, scientists will be looking for signs of ancient geological activity similar to the geyser-spouting, tiger-stripe fractures in the moon's south polar region. Features observed during the flyby could help them understand whether the north also was geologically active at some time in the past. Since Cassini's 2005 discovery of continually-erupting fountains of icy material on Enceladus, the Saturn moon has become one of the most promising places in the solar system to search for present-day habitable environments. Mission scientists announced evidence in March that hydrothermal activity may be occurring on the seafloor of the moon's underground ocean. In September they broke news that its ocean — previously thought to be only a regional sea — was, in fact, global. 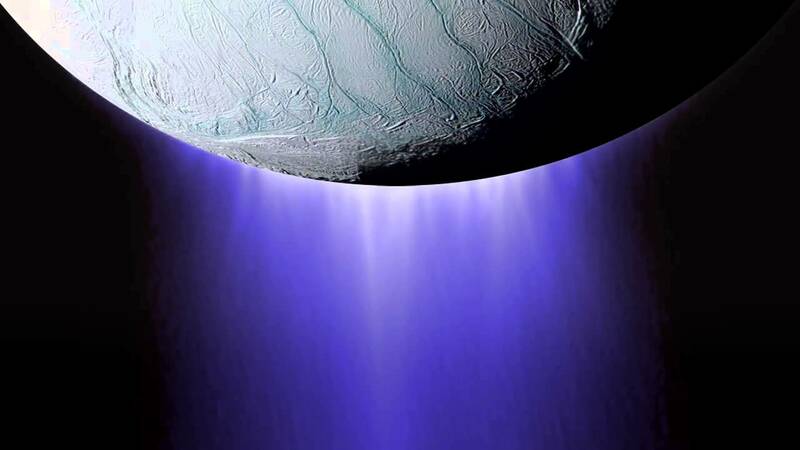 "The global nature of Enceladus' ocean and the inference that hydrothermal systems might exist at the ocean's base strengthen the case that this small moon of Saturn may have environments similar to those at the bottom of our own ocean," said Jonathan Lunine, an interdisciplinary scientist on the Cassini mission at Cornell University in Ithaca, New York. "It is therefore very tempting to imagine that life could exist in such a habitable realm, a billion miles from our home." The Oct. 14 encounter will serve as a prelude to the main event, a flyby of Enceladus on Wednesday, Oct. 28, during which Cassini will come dizzyingly close to the icy moon, passing a mere 30 miles (49 kilometers) above the moon's south polar region. During this encounter, Cassini will make its deepest-ever dive through the moon's plume of icy spray, collecting images and valuable data about what's going on beneath the frozen surface. 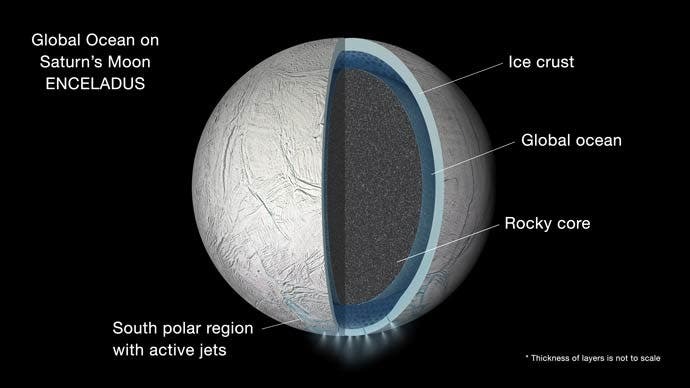 Cassini scientists are hopeful data from that flyby will provide evidence of how much hydrothermal activity is occurring in the moon's ocean, and how the amount of activity impacts the habitability of Enceladus’ ocean. This animation shows NASA's Cassini spacecraft during its Oct. 14, 2015, flyby of Enceladus, which will focus on the Saturnian moon's northern polar region. Cassini's final close flyby on Dec. 19 will examine how much heat is coming from the moon's interior from an altitude of 3,106 miles (4,999 kilometers). Cassini arrived at Saturn in 2004 and still has about two years left on its mission. Beginning in November, mission controllers will begin to slowly raise Cassini's orbit out of the space around the Saturn’s equator, where flybys of the large moons are more common. Coming up are a number of closest-ever brushes with the small moons that huddle near the planet's rings. "We'll continue observing Enceladus and its remarkable activity for the remainder of our precious time at Saturn," said Linda Spilker, Cassini project scientist at JPL. "But these three encounters will be our last chance to see this fascinating world up close for many years to come."